A 5-year-old boy was killed by a stray bullet when Boko Haram attacked a community in Borno State, northeast Nigeria. It was already dark and everyone in Magumeri town, headquarters of Magumeri Local Government Area of Borno State had gone to sleep, but evil was lurking around. Dreaded Boko Haram members had planned to attack the community and the residents were not aware. They launched the attack and killed a 5-year-old boy while a clinic, mosque and shops were also razed. Malam-Tawu said that two women and a teenager also sustained gun shot injuries in the Saturday night attack. Those that were injured have been treated and discharged. "The people have returned to their houses and slept at Magumeri while others came back in the morning. It was only one child of about 5 years old that was killed and three other people wounded by stray bullets. "And also a rocket launcher hit one of our health clinics, including a mosque and some shops along the main road. "This morning I visited Magumeri; the town is very calm. We paid a sympathy visit to the person who lost his child to condole him. "We also paid a visit to the areas where rocket launchers hit some of our structures," the council official said. Malam-Tawu also dismissed ‘misleading’ reports indicating that the insurgents had taken over the town, noting that normalcy has been restored to the area. 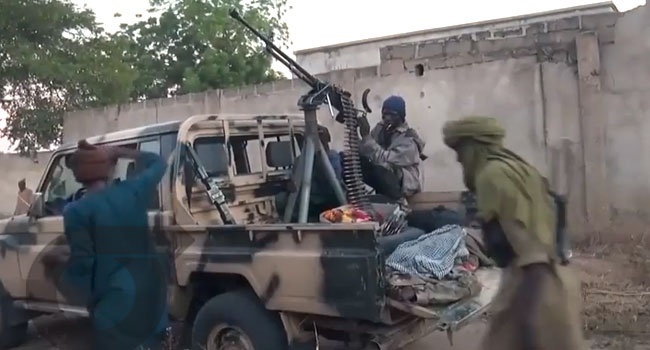 The Nigerian Army had announced that three of its troops were killed and six others wounded while fighting to repel the insurgents’ attack in the town. A spokesman for the 8 Task Force Division, Colonel Timothy Antigha, said in a statement that the insurgents attacked and damaged military formations in the area. Antigha added that the troops had successfully repelled the attack while normalcy had been restored.